Whenever I use to make a Chinese meal for my family, we always had to have the famous red chilli sauce to go with everything from spring rolls to the rice. The red chilli sauce became quite famous as it started appearing on the table for other snacks right from dokhras to pudlas. My husband and I rarely have the red chilli sauce at home and I can’t remember the last time I actually prepared a whole Chinese meal at home. Whenever we feel like having Chinese we go to the famous Galaxy Restaurant. I miss the Chinese restaurants in India. Anyway getting back to the red chilli sauce, I use a teeny weeny bit of it to spice up soups, mix it with butter for a sandwich or to go with any of the gujju snacks. The sauce stays for over a month in the fridge. Wash the chillis. Cut off the stalk and slice the chillis. Put the slices in a bowl or container with the vinegar and mix it up well. Cover and let the chillis marinate overnight. Process the chillis into a coarse or fine paste in a food processor. Throw away any remaining liquid. When it is hot add the carom seeds and the chilli paste. Add the chilli powder and salt and mix well. Let it cool and then store in a jar. If the chillis are hot, then you may not need the chilli powder. It depends on your taste. Add more oil if you are going to use the spicy oil. I prefer to use the thick variety of chillis as show in the photo. However, you can use any type of fresh red chillis available in your area. 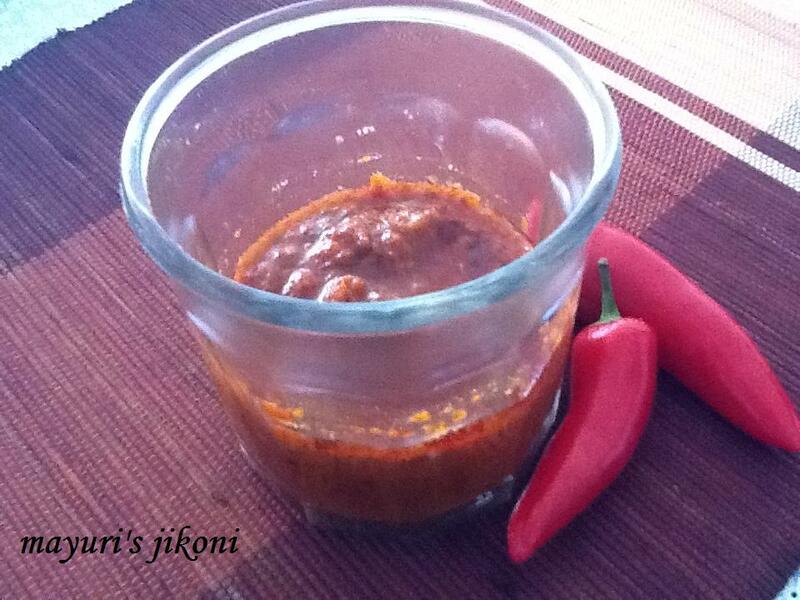 Fiery chilli sauce. Thanks for sending it to Lets cook preserves, jams and chutneys event at simply.food.